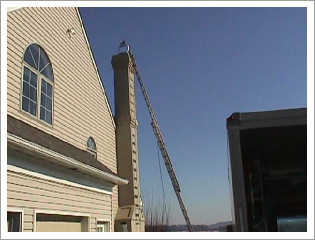 Commonwealth Chimney Sweeps in Harrisburg, PA installs properly lined chimneys for better performance. Most masonry chimneys were not designed to handle the venting requirements of modern high efficiency heating appliances burning liquid propane, natural gas, oil, wood, pellet or coal. These improperly lined chimneys can cause a number of costly structural and cosmetic problems for the homeowner, and also create potentially serious safety hazards. In 1996 there were 23,000 residential fires related to chimneys and solid fuel appliances in the United States. 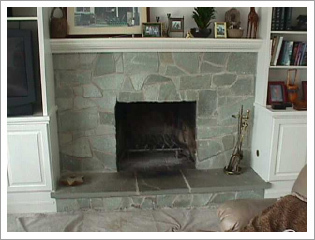 Each year there are thousands of cases of Carbon Monoxide poisoning due to improperly lined chimneys. Commonwealth Chimney Sweeps in Harrisburg, PA repairs installs and lines all types of chimneys to make them more efficient. Outside view of high chimney being relined after chimney fire cracked flue tiles. Inside view of fireplace which had a chimney fire. 25ft of 10" round Stainless Steel liner being drawn up chimney to replace clay flue tiles that were cracked by fire. 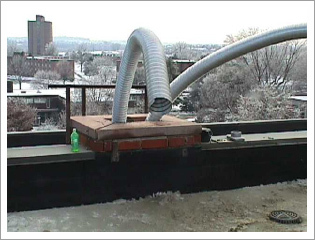 A commercial chimney being lined with two liners. These stainless steel liners are sixty feet long and are connected to a kiln. 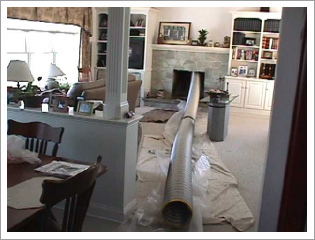 Get expert advice from our professionals and reline your chimney today. Call us now.